Alik’s lives are not devoid of moments of beauty and love though. He lives through several ups and downs, but always seems to be unable to resist the urge to fall in love with women trapped in nearly impossible situations. Like the aforementioned roller coaster that makes you sick but you simply can’t avoid getting on one more time, Alik cannot say no to his own emotions. Herein is where Baker makes excellent use of the idea of Luna Park to create his overriding metaphor. Life and love are strange, splendid, and often magical things. Baker uses the metaphor of a carnival ride as the structure for his pacing as well. His story takes a really strange and surprising twist near the end, and the build up to this ending gives no clue as to the direction the tale is taking until the last few pages. It’s a pretty interesting twist, but I have yet to tie it into his overall theme effectively in my mind yet. As for the pacing, up until this strange twist of an ending, it is actually more interesting than the actual final reveal. Alik, the Chechen War veteran is the main protagonist throughout nearly two thirds of the tale. When he steps through the fun house and we are told the story of another young Russian man named Alik the pacing speeds up rapidly. By the time we get to the Alik of WWI and finally Alik the assassin, the story is moving at near breakneck speed. This pacing is reminiscent of the experience of a roller coaster ride at an amusement park. There is the long wait (build up of Alik’s story) the quick loading of the coaster (the time jumps to the other Alik timelines), and the quick climax and end of the ride (Alik’s final actions). Often life’s major events come at us with no warning or at least at a breakneck speed themselves. Baker makes interesting and fresh use of the trite “life as a rollercoaster” metaphor, by expanding it into a “life as a Luna Park” metaphor. Artist Danijel Zezelj (Northlanders) brings Alik’s tales to life in a strange way that is presented as a mixture of hyper detail and simplicity. His unique style of penciling incredibly detailed landscapes and complex psychedelic imagery and simple near detail-less characters in instances highlights Baker’s unique amusement park as life theme. Life, like a trip through an amusement park, is full of detail that jumps out at us on occasions and bland characters that blend together. Many of his characters outfits, for example, lack hyper detail, but they are very representative and recognizable as artifacts of their respective time periods, which are many in Luna Park. Overall, his artwork is fantastic in every way, but it is his penchant for recreating the landscapes of turn of the century New York, modern war-torn Chechnya, Coney Island and revolutionary Russia that really injects Luna Park with life. His visual background settings are almost a character of their own. 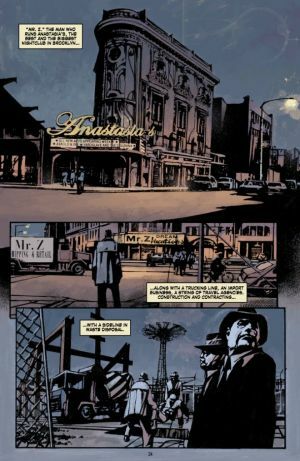 Zezelj’s paring with Baker on Luna Park is perfect since Baker is a writer who brings his beloved New York to vivid life in a very accurate and historical way. Zezelj manages to bring Baker’s New York to life visually on the page like Baker’s words do in his novels. 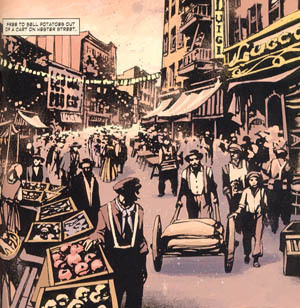 Dave Stewart’s colors, as always, manage to create great effect without being overbearing. 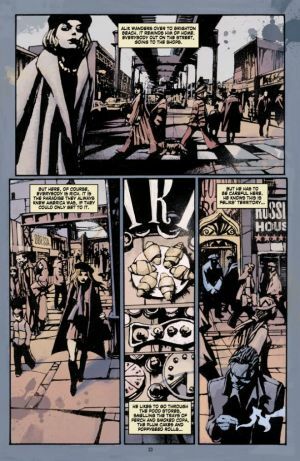 His mono-color approach, which is shaded with variations on the main panel or page’s color scheme creates a moody, and when needed, historical effect that is striking visually. 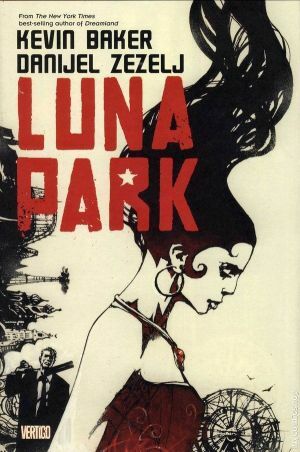 Luna Park is a strange and winding tale of war, love, family, and fantasy. At its heart though, it is a cautionary tale as well. While the allure of the Luna Park and Coney Island of the mind (OK I had to work in Ferlinghetti’s only great work’s title somewhere here in all this talk of Coney Island and literature) is grand with its lights, sights, and thrills…we need to remember that our lives are full of little lives that are begun, shaped, and ended by the choices we make and the lessons we learn from such choices…or not.